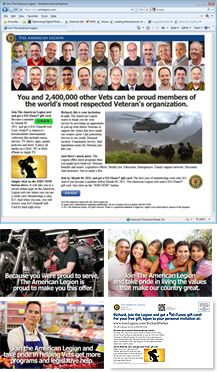 Creative Direction created, produced and managed direct marketing mail, online, mobile, social network, and email programs for young Vet and member acquisition multi-channel programs for The American Legion. Creative Direction announces an investor search for a new marketing technology media platform, Social Networks That Do. INDIANAPOLIS, IN / September 26, 2011 - Creative Direction, a marketing technology company located in Indianapolis, Indiana, has announced a new venture designed to help businesses and organizations make the most of social networking. The new company, Social Networks That Do, helps companies build, populate and manage their own social networks. The social network phenomenon has spawned a new style of online community that has caused a significant change in the way products and services are marketed today. Social networking now accounts for almost 1.5 billion users on an internet serving 2 billion plus. The numbers are staggering. Facebook, as an example, is nearing a billion members and Twitter sends out more than 1 billion tweets every day. As the two social network sites are making plans to go public in a few months, there currently appears to be a window open for those looking to invest in innovative social networking technology concepts and the companies that develop them. Although social networking is not new to the business world, being able to create a privately branded social network media certainly is. For example, Social Networks That Do can be custom designed to help any organization develop a unique presence online based upon its own products, services, corporate philosophy, or attributes. This new approach provides a value-priced and easy-to-manage way to build online community support around an issue, topic, unique service, event, or lifestyle. It's the latest way to target, attract, develop, and retain friends, prospects and customers who contribute, collaborate, and share in similar interests. Creative Direction is looking for those who would like to consider investing in Social Networks That Do to develop products and services for an underserved niche category in the rapidly growing social networking business. Richard Parker, President of the company that developed Social Networks That Do, said at an introductory meeting in August, "The two largest social network sites were not designed to be used as business tools in the first place. They offer the same service to a business customer as they do for a 14 year old looking for friends online. That is especially true since both seem to be changing toward more personal networking." The www.socialnetworksthatdo.com new web site was developed to showcase how a proprietary approach to social networking sites looks and feels so those interested can see how a feature-filled, branded social network site can make a big difference in their social network marketing efforts. "What we are proposing is an opportunity to invest in a company with immediate market-applicable ideas, experienced management, a relatively small investment, and a fast-track growth plan," said Parker in closing comments. Social Networks That Do allows businesses to build, populate and manage their own social networks. Social Networks That Do is a Creative Direction, Inc. company designed to help businesses grow through the innovative application of marketing technology. To see how the new social network site works or to get more information, visit www.socialnetworksthatdo.com. To contact Social Networks That Do directly, call 765-883-8431, or send e-mail to info@socialnetworksthatdo.com.